Waikiki is known for its beautiful beaches, great weather and vibrant atmosphere on the scenic southern shore of Oahu. With close access to exceptional restaurants and shopping as well as fun activities and entertainment, staying in a Waikiki condo provides everything you need for a the Hawaii vacation of your dreams. 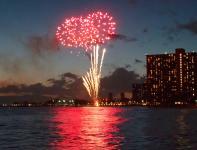 Waikiki offers an abundance of activities and sightseeing including many historical sites and natural attractions. Visit the iconic Waikiki Beach where vendors along the shore offer surfing and stand up paddle board lessons, outrigger canoe rides, sailing excursions and other activities. Fronting this shoreline are many shops to browse and places to eat with live entertainment. Golfers will delight in this region's many exceptional courses including Waikiki's Ala Wai Golf Course. Also on the south shore are the Executive Course and Championship Course in Hawaii Kai with sweeping ocean views. To see an amazing array of Hawaii's marine life visit the Waikiki Aquarium which features a variety of exhibits including a touch tank. Or head over to Hanauma Bay just to the east to see the fish while snorkeling amidst the coral reefs. Plant lovers will enjoy a visit to Koko Crater Botanical Garden east of Waikiki in an extinct volcanic crater. For amazing views of the windward shore take a drive up to the Nuuanu Pali Overlook which is also an important historical site as the location of one of King Kamehameha's major battles. One of Hawaii's most visited attractions is Pearl Harbor with a new Visitor Center that provides information about the site's USS Arizona Memorial as well as the Battleship Missouri Memorial, and nearby is the Pacific Aviation Museum. History lovers will also enjoy a visit to the Bishop Museum in Honolulu which displays rare Hawaiian artifacts from ancient times and hosts many programs including Planetarium shows. Whatever ocean activities you choose during your Waikiki vacation you will likely find the perfect beaches to enjoy them. Surfing, swimming, sunbathing, sailing excursions, snorkeling, stand up paddle boarding, and scuba diving are all options. You can even take an underwater tour in a submarine. During the winter months whale watching tours are offered to get up close and personal with 40-ton humpback whales. Waikiki Beach stretches for three miles along the southern shore of Oahu. This is an exciting beach with lots of options for water activities from swimming to sailing excursions, and also a great place to benefit from the local knowledge by taking a surfing lesson. Waikiki Beach is fronted by the bustling Kalakaua and Kuhio Avenues where you can explore the many shops and grab a bite to eat. Along the Waikiki shore are numerous named beaches including Duke Kahanamoku beach on the western end, then Fort DeRussy Beach, Gray's Beach, Waikiki beach, Kuhio Beach, Queens Surf Beach and finally San Souci beach on the eastern end. Just east of Waikiki is Hanauma Bay with great snorkeling amidst coral reefs and an array of colorful marine life in a submerged volcanic crater bordered by a nice beach. Just to the west of Waikiki is Ala Moana Beach Park which is nice for picnics. For more beach explorations take a drive up the windward shore to Kailua Bay which is great for a variety of water sports with equipment rentals near the shore. Nearby is Lanikai Beach which is one of Hawaii's prettiest beaches with powdery white sand and crystal clear water as well as scenic views of the Mokulua Islands offshore. Also a fun day trip is a visit to see the famed north shore beaches like Waimea Bay, Sunset Beach and the Banzai Pipeline where world-class surfing competitions are held each winter. Waikiki restaurants offer something for every taste from fine cuisine to casual fare and local-style favorites. Take a stroll along Kalakaua Ave. and Kuhio Ave. and you will find dozens of exceptional eateries with everything from standard American food to upscale Hawaii Regional Cuisine which emphasizes innovative uses of locally grown fruits and vegetables as well as freshly caught fish and other seafood. Check out the Waikiki Beach Walk as well as the Royal Hawaiian Center for a wide assortment of dining choices as well as live entertainment including local musicians and hula dancing. Many venues along the Waikiki shoreline feature live music in the evenings for a memorable sunset dining experience with great ocean views. Duke's Waikiki is a renowned oceanfront venue on Kalakaua Ave. at the Outrigger Waikiki where you can take in views of the beach from the dining room or the Barefoot Bar. For a great local-style plate lunch to take the beach stop in at the Kakaako Kitchen on Ala Moana Blvd., also known for their budget prices. 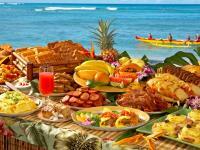 For authentic Hawaiian food as well as cultural entertainment attend a traditional luau feast. Waikiki is a shopper's dream with everything from the top designer labels and fine jewelry to hand-crafted Hawaiian gifts and souvenirs. For fun exploring as well as entertainment check out the Waikiki Beach Walk which has more than 50 shops, and the Royal Hawaiian Center with more than 110 shops and places to eat. These two shopping and entertainment complexes often have cultural activities including lei making as well as ukulele and hula lessons for visitors. You could spend days exploring and enjoying the shops of Waikiki. Head over to downtown Honolulu for more fun browsing including the eclectic shops of the Chinatown district which has a thriving arts scene. Also nearby is the upscale Aloha Tower Marketplace at Honolulu Harbor, and the expansive Ala Moana Shopping Center, an open-air mall with nearly 300 shops and places to eat set amidst tropical landscaping. Renting a car is recommended when staying in a Waikiki condo so you have easy access to local attractions and downtown Honolulu as well as day trips to the lush and tropical windward shore, Haleiwa town and the famed surfing beaches of the north shore. Most of Oahu's major towns can also be reached on the public bus system which is called "TheBus." There are also some shuttles and trolleys in Waikiki that can help you get around the area. Waikiki weather ranges from about 70 to 85 degrees F. throughout the year, a bit warmer at times during the summer months and a bit cooler during the winter. Rain and wind conditions vary in the different areas of Oahu with the north and eastern shores generally a bit wetter and cooler than the south and west shores. Winter months typically see more rain than summer, particularly on northern and eastern shores. Ocean conditions vary from day to day and through the seasons. Intermittent swells can create high surf and strong currents, with north swells typically affecting northern facing shores during the winter months and south swells bringing waves to southern beaches during the summer months. Some beaches provide more protection than others from the open ocean. For swimming and other ocean activities it is best to visit Oahu's lifeguarded beaches, obey all posted warnings and ask water safety personnel about the conditions on that day for the activities you choose. Waikiki condos provide the ideal way to enjoy your Hawaii vacation with all the luxuries of resort living and the comforts of home. Browse through our Waikiki condo listings to get an understanding of the different amenities and property features we offer. Our goal at Hawaiian Beach Rentals is to provide you with a with an unforgettable Waikiki accommodation for your dream vacation. We take pride in having the largest selection of high-quality condos in Waikiki and we stand behind our product, making sure only the best properties are listed on our site. If you have questions about our Waikiki condos or which Oahu destination is best for your vacation needs, please give us a call and we will be happy to assist you. See below for an overview of some of Waikiki's finest condo resorts. Waikiki has a fascinating history as a home to Hawaiian royalty centuries ago. After Western contact in 1778 this shoreline became a stopping place for many famous visitors from around the world. Follow the self-guided route called the Waikiki Historic Trail to learn more about important people and landmarks of the area. The route begins at the Royal Hawaiian Center and is marked with informational plaques placed on bronze surfboards. At Kuhio Beach make sure to see the statue of the famed Duke Kahanamoku who was an Olympic champions swimmer, expert surfer and considered Hawaii's "ambassador of aloha." The Aston Waikiki Beach Tower is across the street from Waikiki Beach. Condos and has gourmet kitchens, private lanais, air conditioning and washer/dryers. The building has a fitness room and also a recreation deck with a jet spa and pool. Close by is the International Market Place and also the Royal Hawaiian Center with a wide variety of shopping and dining. Also close by is Kapiolani Park as well as Waikiki Aquarium. Outrigger Regency on Beachwalk offers boutique one and two-bedroom condominiums featuring gourmet kitchens with refrigerators, ceramic stovetops, microwaves, dishwashers, cookware and tableware. Room have a flat screen television, free high-speed WiFi and a balcony. Other amenities include air conditioning and an in-room safe. Next to the popular Waikiki Beach Walk with lots of great shops and dining options. The Wyndham at Waikiki Beach Walk condos in the heart of Waikiki has a lounge, fitness center, bar, free high-speed internet (WiFi), restaurant and pool. Condos have kitchenettes, and are close to shops and restaurants. The beach just a five-minute walk away. Outrigger Waikiki Shore on Waikiki Beach offers spacious, apartment style accommodations, many with ocean views from Diamond Head to the western shore. Next to the Waikiki Beach Walk with an abundance of shops and restaurants. Guests have access to the pool and fitness center next door at the Outrigger Reef on the Beach hotel which has two restaurants and nightly Hawaiian-style entertainment. Studios have a kitchenette while suites have a full kitchen All units have a washer and dryer and free WiFi. Waikiki Banyan is close to restaurants, shop and attractions and just a few blocks away from Kapiolani Park and the Waikiki Aquarium as well as the zoo. Amenities include on-site management, upscale lobby, recreation deck, swimming pool, lounge chairs, two hot tubs, a sauna, play equipment, tennis and basketball courts, a putting green, grills for barbecuing, on-site coin laundry and a small restaurant. The Waikiki Beach Condominiums are located in a 23-floor building close to many shops and restaurants including the International Market Place just three blocks away. The building has 100 one-bedroom units with well-equipped kitchens including an oven, refrigerator, four-burner stovetop, dishwasher and cookware. The building offers free parking and has a rooftop swimming pool with great Honolulu views as well as a sauna, barbecue area and exercise facility. The beach is a 20-minute walk away. Condos also have dining and sitting areas, sofa beds, washers and dryers, cable TV and WiFi for a fee. Castle Waikiki Shore Beachfront Condominiums include studios as well as one and two bedroom suites with kitchenettes or full kitchens as well as washers/dryers and wide lanais, most of which have ocean views. This is one of the few condo properties right on Waikiki Beach with very close access to great shopping and dining as well as the vibrant nightlife of Waikiki. Also close by is Fort DeRussy Park with a lawn and shaded areas great for picnics. Outrigger Reef on the Beach includes the Ocean Tower and Pacific Tower in Waikiki. Amenities include free high-speed internet, artful interiors and lobby, newly remodeled, Diamond Head views, fitness center, Serenity Spa Hawaii, wedding services, sitting area with library, Kani Ka Pila Grille poolside restaurant featuring nightly live entertainment, oceanfront Shore Bird Restaurant & Beach Bar, Ocean House Restaurant, resort shops, cultural activities, port cochere, and new pool and pool deck. Just steps from the Waikiki Beach Walk for great shopping and dining. Please browse through the Hawaiian Beach Rentals condo listings in Waikiki including the Trump International Hotel Waikiki, Allure Waikiki Condos, Aston Waikiki Sunset, Aston Waikiki Beach Tower, Aqua Palms Waikiki, Wyndham Royal Garden at Waikiki, Waikiki Skytower, Waikiki on the Sand, The Ilikai Hotel, Aston at the Waikiki Park Heights and Waikiki Banyan. In the Diamond Head area is the Diamond Head Beach Hotel.